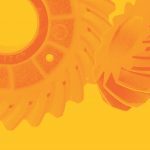 Testing epicyclic gear systems leads to discoveries that will help eliminate gear noise during the design phase. 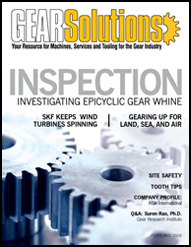 Gear whine is a major source of unwanted noise in automotive applications. It is tonal in nature, which makes it more apparent to the human ear than other stochastic noise mechanisms. 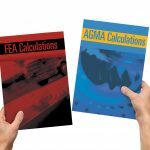 Prediction of gear whine behavior in automatic transmissions is a particularly complex problem, where the conventional FEA approach precludes the rapid assessment of “what if?” scenarios due to the slow pace of model building and solution times. This paper will present an alternative approach, which is a fully parametric functionality-based model, including the effects of and interactions between all components in the transmission. It will be shown how the transmission error in all gear pairs can be predicted, and how this can be used to excite the transmission model dynamically to predict the vibration response in any part of the system, including the housing. 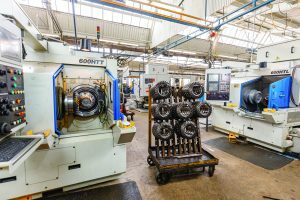 Examples will be given to demonstrate the ability of this approach to rapidly investigate the system-wide effects of variation in parameters such as bearing pre-load and casing-bearing bore positional tolerance. The source of this gear whine noise is a dynamic excitation at the loaded gear meshes caused by transmission error (TE) [1, 2]. The vibrations excited by the TE are transmitted through the gears and shafts to the main bearings, where they are coupled to the housing and produce acoustic radiation. Therefore, the TE to noise transmission path includes the majority of the components in the gearbox. 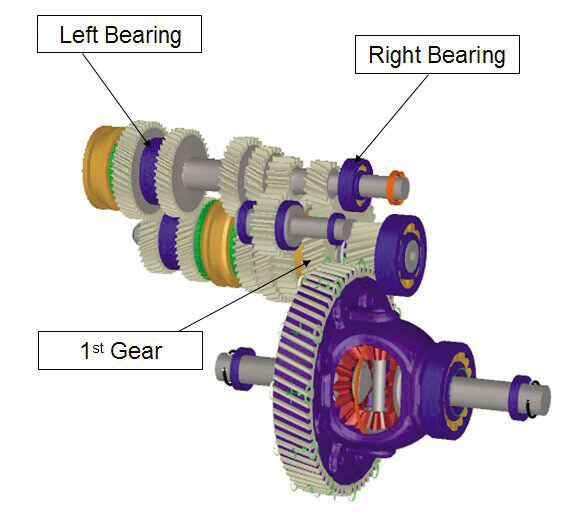 The philosophy of this approach is to enable the design engineer to identify any potential failure modes (such as high gear whine noise leading to customer complaints) so that countermeasures—improved gear micro-geometry, insensitive to manufacturing variability, for example—can be implemented as early as possible in the design process, when the design space is large and the costs of making the changes low. This idea is sometimes known as Failure Mode Avoidance . In the automotive industry, the shaft/bearing/housing analysis calculations are typically performed either by a number of programs making a series of approximations (linear bearings, rigid housings, etc.) with the corresponding reductions in accuracy, or by resorting to a full FE model of the whole transmission system. However, such an exercise in FE can only be attempted by experts with a sophisticated FEA package, and by expending much time and effort. Even then success is not guaranteed, due to the difficulty in accurately modeling bearing contact and the limitation that the FEA method would not include gear tooth contact, and so, in the case of gear whine prediction, be limited to unit TE excitation. Alternatively, a proprietary software package can be used . In this approach, modeling and analysis of a complete automatic or manual transmission is quickly completed . 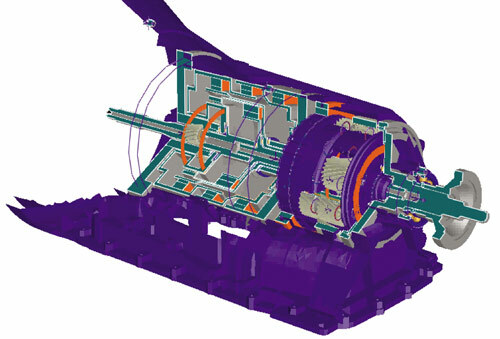 Gears, planetary gear system, bearings, and shafts are modeled as analysis objects with correlation to validated tests. All the gear meshing points, forces, load distributions, and boundary conditions are calculated and considered. The planetary carriers and housing are imported as FEA components and coupled with the internal transmission through the bearing nodes. 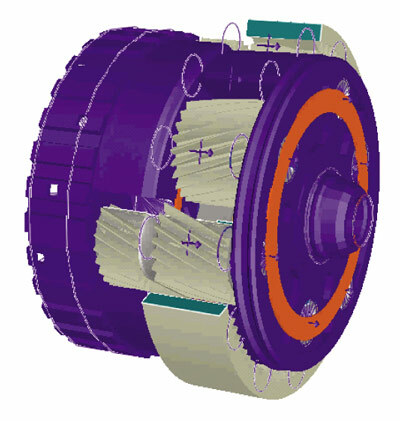 The transmission system model built by this approach is very compact compared to conventional finite element models. 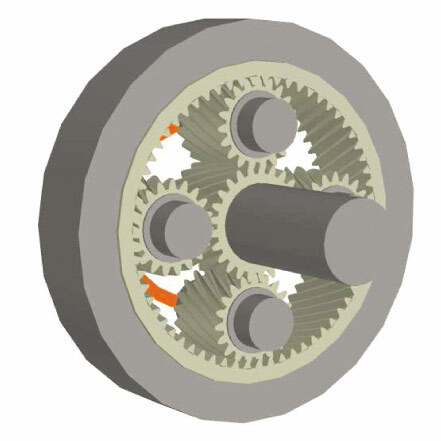 Since the gears, shafts, bearings, and clutches are all defined as objects, it is much easier and faster to obtain these 3D components by just keying in the design parameters and editing their attributes. The modeling time for those components and assemblies is significantly reduced and any possible mistakes, which may inevitably happen in a conventional modeling process, can be avoided. 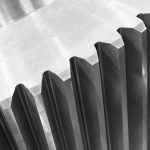 The engineer does not have to consider details such as defining the powerflow for a particular speed, the direction of gear mesh forces, or the stiffness of non-linear loaded bearings. Rolling element bearings are added to the model by selecting the appropriate component from a pre-defined catalogue. The model includes a detailed representation of the rolling element internal details (as shown in Figure 1) and allows for the non-linear stiffness to be determined for any load condition, developed from standard methods . The stiffness sub-matrix, linking the displacements and tilts of the inner and outer raceway geometric centers, is obtained as the slope of the force versus deflection curve at the bearing’s operating displacements . 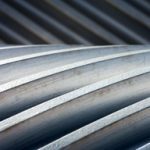 The stiffness terms include the contacts of the rolling elements with the raceways, the non-linear effects of internal clearance, and preload. In order to include the mass and stiffness properties of non-uniform components such as the housing and the planet carrier, those parts are first imported as finite element models. The models are then connected to the appropriate bearing components using RBE2 elements, and the model grounded if necessary (housings must normally be grounded in some way). Component mode synthesis is then performed on the FE models to generate a reduced mass and stiffness matrix. It is important to note that this process only needs to be performed once, during the modeling stage, and ensures that the subsequent system analyses will be rapid because a full FE analysis is not required. 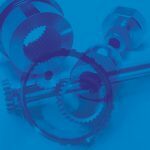 Any spur, helical, hypoid, or bevel gear can be defined and analyzed within the system. 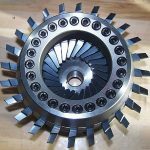 Helical gears are typically described in terms of macro-geometry parameters—number of teeth, module, helix angle, pressure angle, etc., and micro-geometry parameters—crowning, involute, and lead slope, etc. 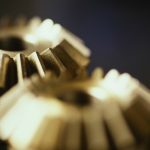 The gear contact analysis includes a consideration of the calculated gear mesh misalignment, a non-linear tooth stiffness, as well as the detailed micro-geometry surface definition. The predicted position of the contact on the tooth flank will influence the effect of the gear mesh force. 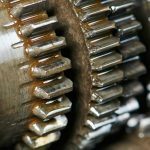 For example, if the contact is away from the center of the tooth, this will generate a turning moment on the gear, which will have to be reacted by the supporting bearings. As well as gear pairs, planetary gear sets can also be modeled. An example is shown in Figure 2. A complete six-speed automatic transmission is shown in Figure 3. For a detailed analysis report on this transmission, please see . When the system model is completed, the boundary conditions of the analysis are then defined. This entails specifying the input speed and torque (or power) and which clutches or brakes are locked. 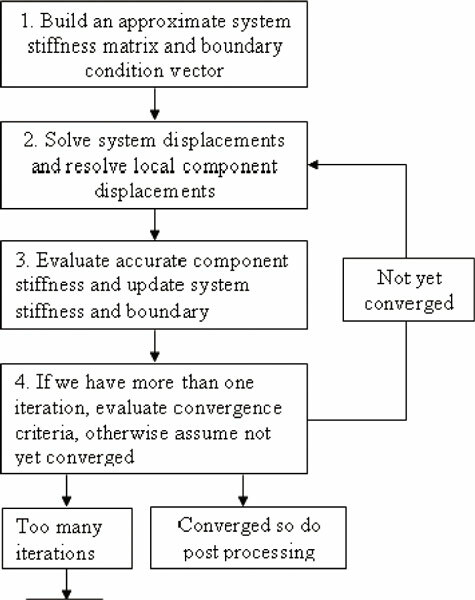 The convergence scheme is shown in Figure 4. The non-linear analysis can be completed in a couple of minutes. The results show the full six degree of freedom deflection of the system, the rotational speeds of and forces acting on all components, gear and bearing misalignments. Additional results, such as the expected damage that each component will suffer, are also calculated. • relative phasing of planetary gear meshes, including the phasing between the various sun-planet meshes, phasing between the various ring-planet meshes, and phasing between the ring-planet and sun-planet meshes of a given planet. Previous studies have shown the critical importance of phasing in planetary gear noise [9, 10, 11]. 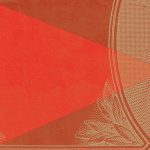 A key point is that the analyses are solved simultaneously. For example, it is not possible to solve the shaft-bearing system to predict the mesh misalignment and then use this misalignment to predict the transmission error at the gear mesh. This is because the details of the tooth contact are not only influenced by the misalignment, but the misalignment is influenced by the tooth contact. 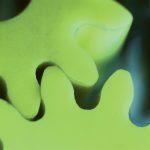 From interrogating the system analysis results, it is possible to extract the time-varying mesh misalignment and transmission error of each gear mesh, including all phase information. These transmission errors are the source of the gear whine; to calculate the vibration response of the transmission system to this excitation, it is necessary to predict the modal properties of the system. The mode shapes and frequencies of the system are then automatically calculated at a steady state load condition . The mode shapes of the system are then excited by the predicted transmission error across a frequency range appropriate to the vehicle operating speed. The relative phase of the transmission error excitations can be critical and so is included in this analysis. It is often interesting and useful to investigate variants of a baseline analytical model. 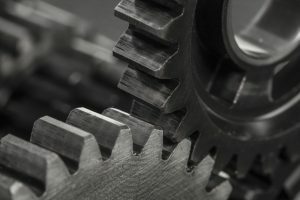 For example, an engineer may want to study the functional effects of the variability of various parameters of a design due to manufacturing tolerances of clearances or gear microgeometry profiles. A significant problem with many CAE methods is the difficulty in modifying the model to perform analysis on variants of the model. For example, if a shaft component needs to be modified it is often necessary to re-model the FE component . This can be a significant time overhead. With the approach described in this paper, the model is defined entirely parametrically so it is very quick and easy to make these changes. 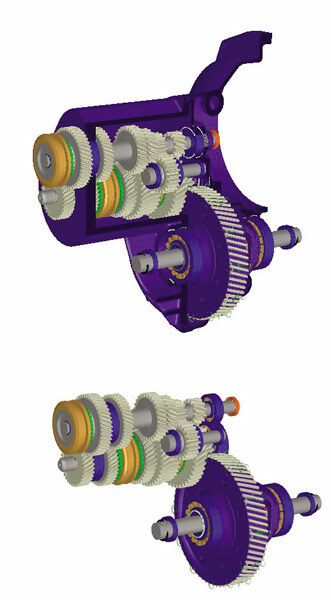 To illustrate the potential of this methodology, a simple five speed transaxle gearbox was modelled. This is shown in Figure 6. The differential cage has been removed to show the internal differential bevel gears. 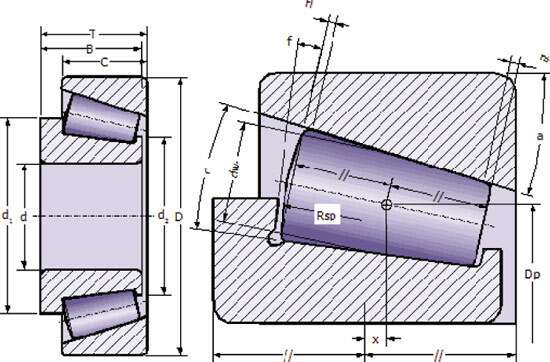 An investigation was performed into the sensitivity of the nominal design to tolerances in housing bearing bore lateral position. These tolerances can be of the order of 100um and are due to the manufacturing and assembly processes. For clarity of explanation, the positional tolerance of the two input shaft bearings was studied. The outer races of the two bearings were independently displaced from -100um to +100um in the X and Y directions (see Figure 7). This type of study can be quickly set up and the analyses completed in a few minutes. 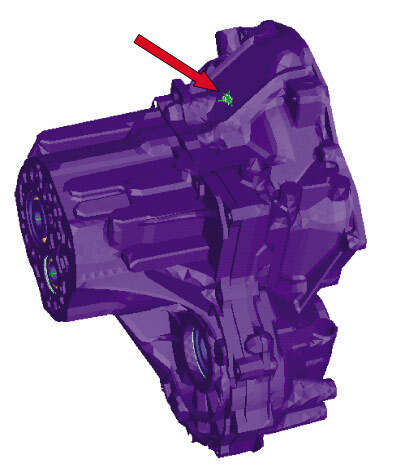 A single load case, first gear, 40Nm on the input shaft, was analyzed. The influence of bearing outer race displacement on the predicted gear mesh misalignment and transmission error of the first gear pair is shown in main effect plots  in Figure 8. 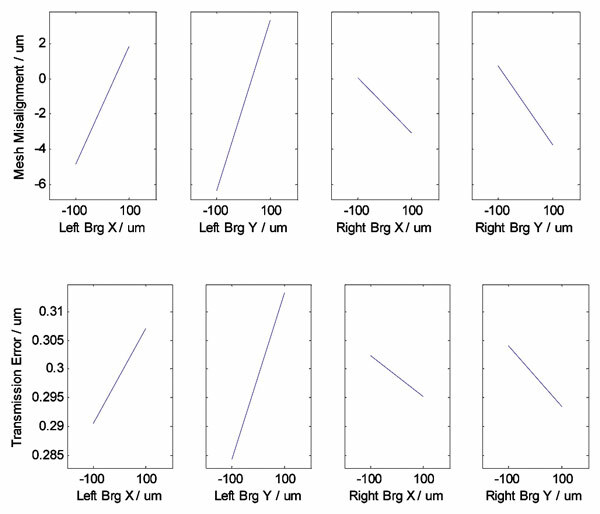 It is clear from these graphs that the largest influence on the mesh misalignment and transmission error is from the left bearing, and a movement in the Y direction has the greatest effect. This is a simple example and shows how the modeling approach can be used to give a rapid understanding of the effects of tolerances. 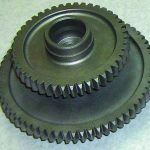 In a more complete study it would be necessary to investigate the effects of all bearings on all gear meshes. This type of comprehensive study could easily be completed in less than four hours. An investigation was performed into the sensitivity of the nominal design to changes in bearing preload. Variations in the bearing preload result from assembly tolerances and also thermal expansion of the housing. An understanding of how the preload effects mesh misalignment and housing vibration (and so gear whine noise) is vital. 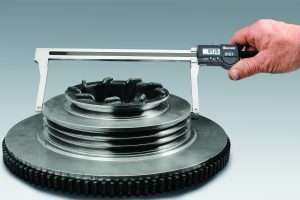 A study was set up to vary the preload on the counter shaft bearings from -50um (clearance) to 150um, in steps of 50 um. 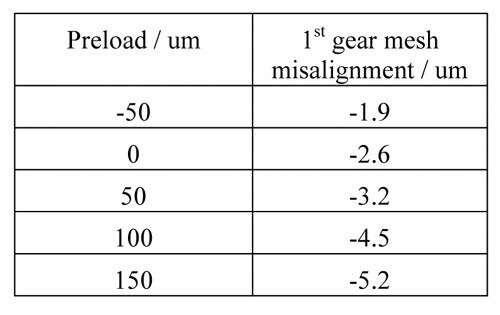 The variation in the predicted mesh misalignment of 1st gear is shown in Table 1. It is clear that the pre-load of this bearing has a significant effect on the misalignment. For each candidate a modal analysis was completed  and the model excited with the predicted transmission error. 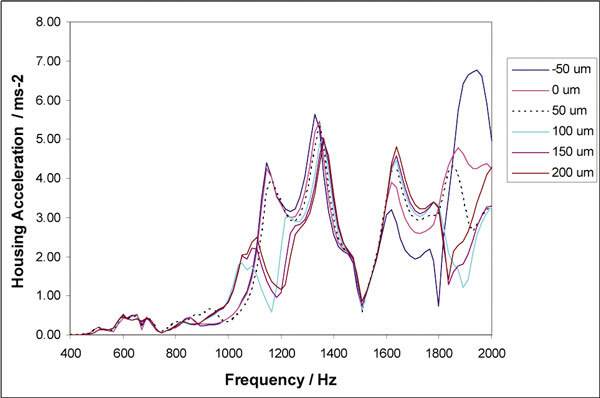 The housing vibration was predicted at a position expected to be a significant source of airborne noise, see Figure 9. The housing vibrations for the six variants are shown in Figure 10. It is clear that the variation in the preload has a significant effect on the housing vibration. This is mainly due to the change in bearing and system stiffness modifying the natural frequencies of the gearbox and changing the transfer paths from gear mesh to housing. This is another simple example to show how a parametric study into NVH performance can be quickly performed. In a more complete study, the effect of the bearing preload on other performance criteria (for example, bearing damage) would be simultaneously assessed. This is possible and could be completed in an overnight run. 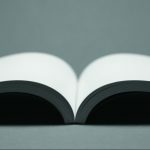 This type of information is useful for the design engineer as it gives guidance on tolerance specification from a functional rather than from a manufacturing perspective. 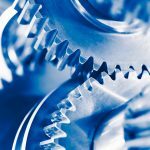 This paper has shown how a software-based parametric modeling can be used to predict gear mesh misalignment, transmission error and gear whine. The potential of the approach was then demonstrated by showing how it was possible to perform a parametric investigation into the effects of the variability of the bearing pre-load and bearing bore positional. Using this approach, an engineer can investigate any parameter tolerance and the effects on the TE and NVH behavior of a complex transmission. It is important to note that the study can be initialized quickly and then the analysis performed in a timescale that is acceptable to a modern design and development program. 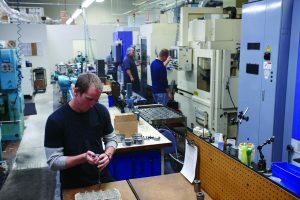 Future work will focus on automatically identifying those key tolerances that should be well controlled and those tolerances that have little or no effect on the system behavior. This understanding will lead to a reduction in manufacturing costs and an improvement in the NVH performance. are with Romax Technology. Visit online at [www.romaxtech.com].